LPWWA – La Plata West Water Authority – Page 3 – I'm on Tap are You? • At the recent meeting of the Board of Directors for the La Plata West Water Authority, there was JOY within the committee when announced that the Phase I construction loan was opened on June 14th, this is the beginning of our waterline to Southwest La Plata County. • The PR Committee is currently looking for an official name for the Intake Structure location at Lake Nighthorse, something that could indicate additional names that would show the different phases as the project grows. • Meetings with the fire department, sheriff’s department and the Durango police department have taken place to insure that security is covered at the intake structure along with the security cameras we have in place at Lake Nighthorse. • A new committee has been formed to look at a manager and/or bookkeeper for LPWWA waterline project to determine which direction this position should take along with a job description. This committee will report back in July. 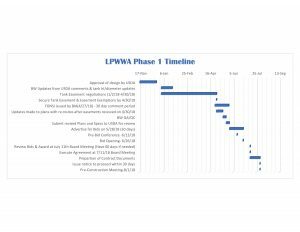 • LPWWA is always in need of help and input for our future phases. Please contact one of the board members here if you can help! Below is an updated timeline for Phase 1. We are now in the bid phase and bids close June 27. Click on Image to view. At the recent meeting of the Board of Directors for the La Plata West Water Authority, changes to the addenda were presented and approved to the Rules and Regulations and are effective 5-9-18. The Rules and Regulations are available on the website, LPWWA.org. The PR Committee is currently getting logistics in order for a completion ceremony for Phase 0. Planning is also in the works for an August 4thBBQ/Meeting for the Water Users in Phase 1. Details forthcoming on both events. The water purchase from Animas La Plata Water Conservancy District (ALPWCD) is in the works as the specifics of payment and closing terms get worked out. Efforts are continuing for consideration of the “Office Property” which include many possibilities on the site such as a construction project office, staging area for the contractor, water dock location, and potential LPWWA office. Many logistics are being considered ad explored for surveys, permits, etc. LPWWA is always in need of help and input for our future phases. Please contact one of the board members (contact info on the website) if you can help! 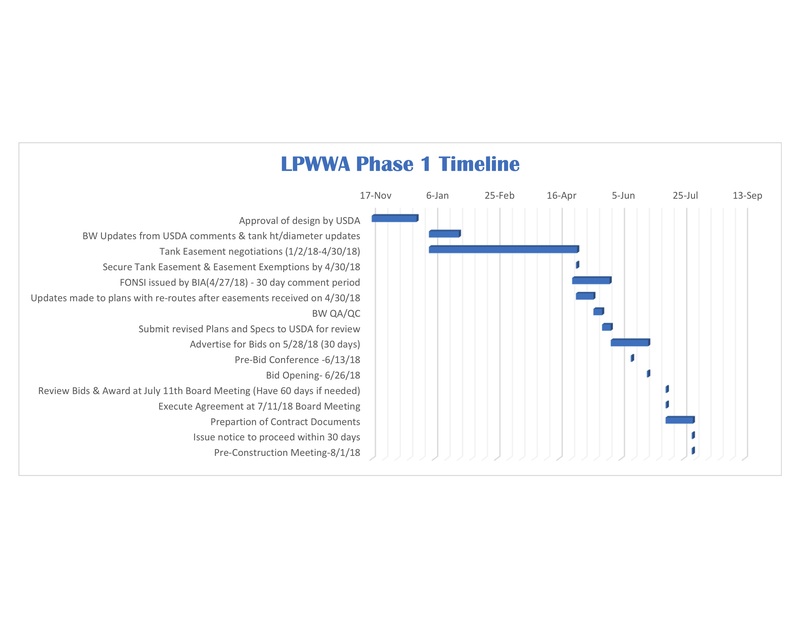 • At the recent Board of Directors monthly meeting for La Plata West Water Authority (LPWWA) held on 4-11-18, the board is continuing its efforts working on policies, procedures, and resolutions relative to board administration, easements, and water user agreements. A main consideration is the obligation to provide easement for placement of the main pipeline on the property named on the water user agreement. Easements are in the critical process of being procured to meet the April 30, 2018, deadline for USDA funding. • The LPWWA Board is finalizing the draft request for the purchase of the allocated water from ALP. This is in preparation for the ALP Board meeting in May 2018. • The commissioning of the system to get water out of Lake Nighthorse for use by LPWWA is occuring over the next several weeks. This phase, Phase 0, is coming very close to completion. • Other new business includes setting up to participate in the 811 Call “Before” You Dig Line Locator System. LPWWA will be notified as a utility with possible lines in the area when customers/contractors call in for verification of services in the area they are planning to disturb. • Other new projects include a Quality Assurance/ Quality Control (QA/QC) effort to get up to speed on the Federal Drinking Water Standards for community water systems of this size, thus requesting the sampling plan and monthly lab analyses results for the Lake Durango Water Treatment system as specified in the entitie’s agreements.